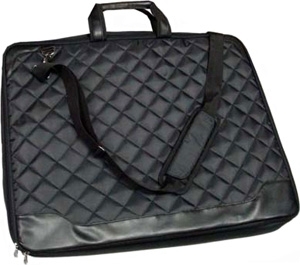 The Weber 1853 Series is a fashionable Artist/Commercial Professional Portfolio constructed of Quilted Nylon sides with Leatherette trim. Features include removable interior zippered pouch and full size opaque secured area that encloses with a 3 sided zipper. 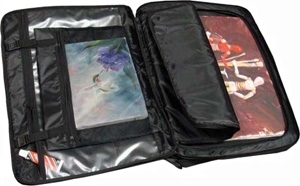 Includes a protected clear pouch with single zipper closure. Adjustable padded shoulder strap with metal hardware. Comfort handles. Zipper closure and water resistant.